This past weekend was crazy busy for me because of two events: Orbit’s third anniversary in the United States, and New York Comic Con. I wasn’t sure until the last minute that I’d be able to attend NYCC, but a friend helped me out — so I got to wade through packed aisles full of cosplayers and creative reenacters, fans and professionals, and all kinds of booksy goodness. NYCC isn’t just about comics anymore; there’s a growing SF/F-writer presence there, and all the big publishing houses were out in force promoting their stuff, including Orbit. (And a few lucky people may have snagged free copies of the mass market edition of The Hundred Thousand Kingdoms there, signed by Yours Truly.) It was a lot of fun. But never mind all that. Let’s talk about something important. Looklooklooklook! 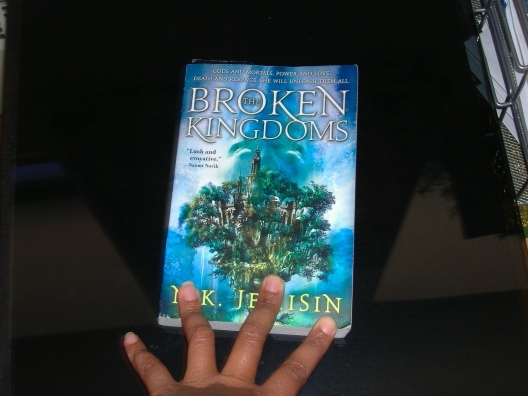 The Orbit folks had a little present for me: The Broken Kingdoms, hot off the presses. This is the first physical copy I’ve seen, and it’s looking a little worn already because I keep taking it out to show it off to people. It’s not out yet, officially, and won’t be for several more weeks — November 2 is the big day. But it’s real, and I haz it, and see? I touches it. We likes it, Precious. Do you know if “The Hundred Thousand Kingdoms” will be coming to hardcover? It’s one of my most favorite books and I’d love to have a hardcover copy of it to keep forever and ever. Nope, to my knowledge it will not be coming out in hardcover. Just mass market and trade paperback. Sorry! Awesome, I hope to pick up a copy en route to Detroit for my conference. Good reading for the trip. Oh wow, it looks beautiful! :) I have mine pre-ordered already. Can’t wait to get my hands on it! I really enjoyed the first book and I’m looking forward The Broken Kingdoms. Congratulations, that’s great. It looks awesome. I wondered if you were going to be putting reviews for Broken Kingdoms on your delicious the way you did with Hundred Thousand Kingdoms? Also, did you get that issue with the German Edition covers sorted out?